Ballpark Basics: A modern take on the classic ballpark. 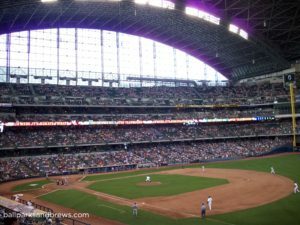 Ballpark Breakdown: Walking up to Miller Park it looks like you are about to enter a spaceship that has just landed inside of a traditional ballpark. The steel and glass retractable roof climbing out of the red brick arches that encompass the walls of the park. 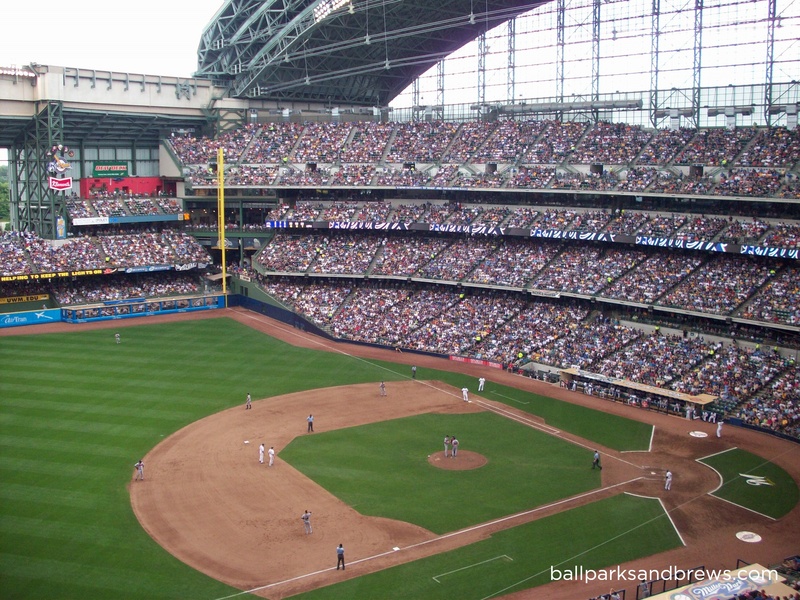 While we typically hate ballparks that are surrounded by parking lots, the tailgate atmosphere that you find at other Wisconsin sporting events has spilled over to Brewers games as well. This is hands down the best tailgating that we have ever seen for a baseball game. 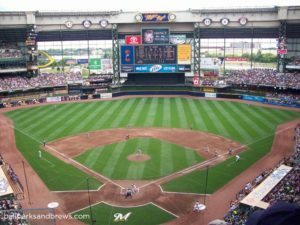 Even though Miller Park would seem to be the antithesis of a traditional ballpark it has incorporated a number of features that make it a great experience. From the tailgating before you enter to Bernie the Brewer sliding down from Bernie’s Terrace to celebrate a Brewer’s home run to the sausage race Miller Park brings its own unique take on the ol’ ball game. The retractable roof does not really take away from the experience and we were lucky enough to see a game with the roof opened and closed. When the roof is open the entire field is awash in sunlight and it is like seeing a game in any traditional ballpark. The retractable roof moves so effortlessly and quietly that you hardly noticing it closing. Once closed, the feel of the ballpark is definitely a little more sterile but not nearly as bad as former domes like the Metrodome (or the current Tropicana Field). 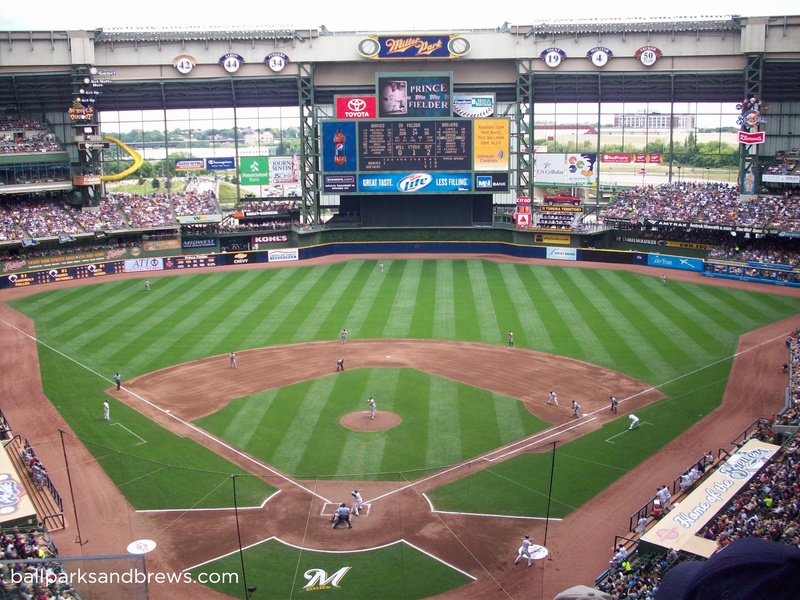 Just like St. Louis’s ballpark, Miller Park is named after one of the dominant beer companies. But just like at Busch Stadium, you are able to find local and craft options throughout the park. 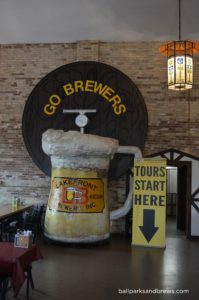 The main local options are Lakefront and New Glarus (which is only available in Wisconsin) as well as MKE Brewing Co. Most stands will have Leinenkugel’s or Sam Adams as well. BEST SPOT FOR BEER: While you can find local beer sprinkled throughout Miller Park, the aptly named Local Brews bar in Section 207 features 24 taps of local craft beer (and Miller Lite). While you couldn’t put Miller Park in the list of retro-style ballparks the team has created some new traditions that make a game in Milwaukee a unique experience. 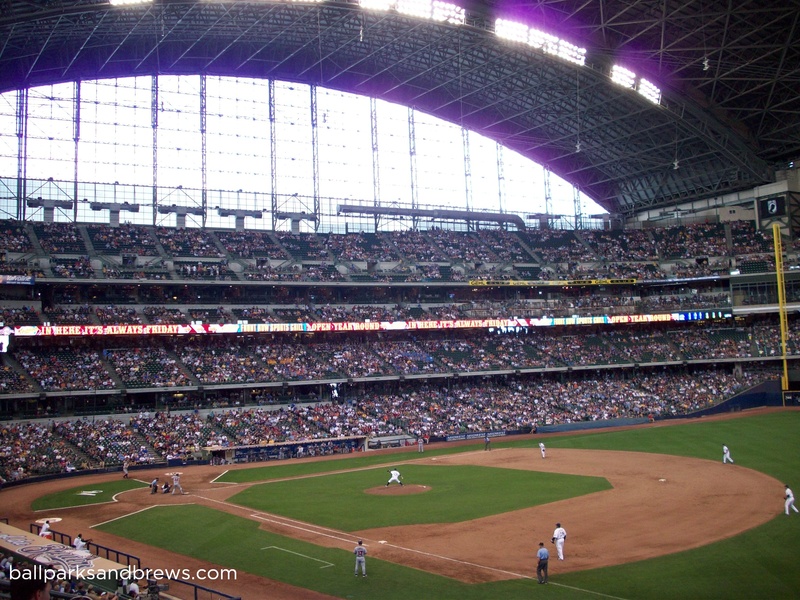 Add the friendly Midwestern staff and the excellent sight lines and Miller Park is a great place to catch a game. Brew Basics: A traditional German beer hall, with an impressive outdoor area, drive up kayaking and a sales pitch. This is a powerhouse brewery that Milwaukeeans seem to unabashedly love. 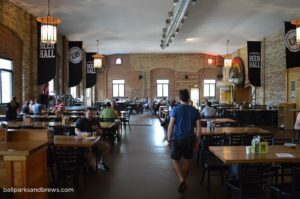 Its an absolutely huge beer hall that is just wide open and feels expansive as you walk in. 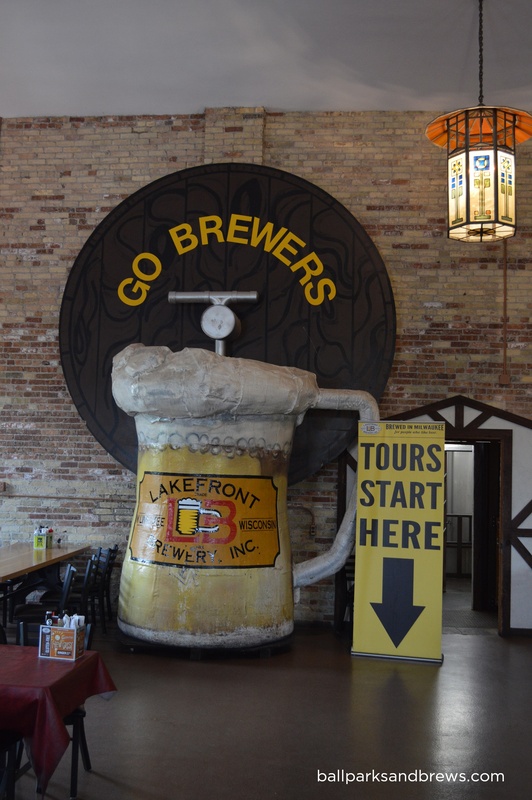 In tribute to the brewery’s history and their favorite local MLB team, Lakefront purchased the chalet and beer mug that Bernie Brewer once slide into at old County Stadium. At Lakefront it marks the start of the brewery tour. Other than that, the inside is done in traditional beer hall fashion, with wooden beams in the ceiling, flags hanging down and long tables to sit family style. The bar runs basically the whole length of one side of the place, and the impressive number of bartenders were handling the crowd with ease. And despite the numerous patrons, every employee I talked to was willing to take the time to talk about the different beers and give recommendations and tasting notes. There’s even a mystery beer on tap if you’re the risk-taking type. The only real drawback is that they’re constantly trying to sell you something. Besides the beer, there were coffee and jerky for sale in various parts of the hall, which had an entire cheese shop set up in one corner. You had to walk through an large swag store to get to the bathroom, and you even had hand scrubs and lotions for sale once you go there. As we’ve mentioned before, one of us is originally from the Midwest (you know this by now, right?). So we are well aware of how special the warm days of summer are up north, and Milwaukee was no exception. 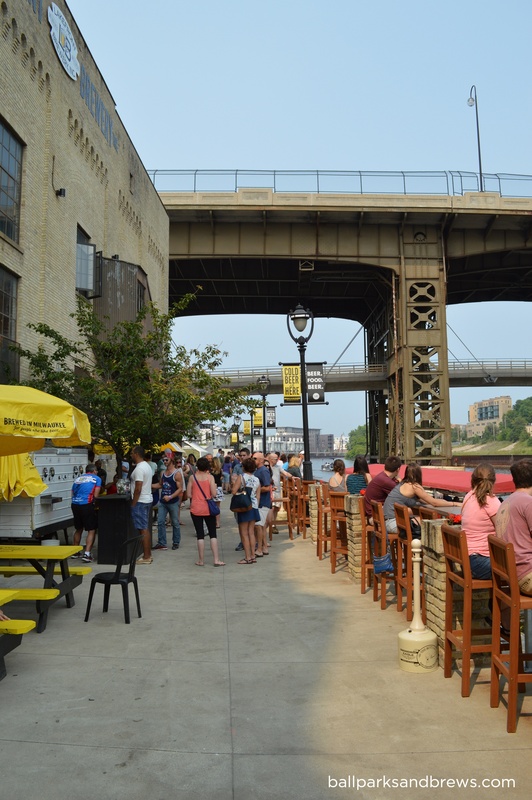 Strategically placed right on the riverfront, Lakefront had oodles of seating outside, and an outdoor tap station whose line was a mile long, and even more crowded as group after group arrived as one of the stops on a city brewery tour. Even packed, it was well worth fighting the crowds to have a seat overlooking the river and watching the boats go by. People were even pulling up and parking their kayaks and canoes to stop in for a pit stop. You have to climb up a tightly boxed set of stairs to get up to the beer hall from the outdoor porch, and fighting the stream of people and wind updraft in a sundress while carrying a flight was no small feat – but it was worth it for everything we got to try, and interesting side note – they don’t seem big on bitterness here, as even with a huge beer list available, everything ranged from 15-38 on the IBU scale. Wisconsinite (4.4 ABV/9.5 IBU) – a summerweiss was a great place for us to start on this perfect July day. Everything is local, or as Lakefront says for this one, “If it’s not from Wisconsin, it’s not in this beer.” The Wisconsinite was a pretty yellow color with carbonation visibly bubbling and a like white wine smell. There is a strong dry wheat taste with this one that ends in a banana flavor which gets stronger as the beer warms. Riverwest Stein (5.7 ABV/16 IBU) – An amber lager that was a ruddy copper color and had light lacing. The nose was smooth, malted and light. This was not a strong red, more of a light session sipper with some malt points in the palate – but it worked for a summer beer. Growing Power (6.7 ABV/35 IBU) This beer had one of the highest IBU rating of any available and was also USDA certified organic. Growing Power is a farmhouse pale ale that was orangey copper and lacked the reddish hues of the Riverwest Stein. The lacing floated on top and though it had visible carbonation, it wasn’t too sparkly when you tasted it. The smell was grainy and citra hoppy, the palate wheaty with a herbal lemongrassy finish; which combined to make it more earthy than a typical pale ale. Fuel Cafe (6.4/18) This coffee stout earns the distinction of being our favorite of the day. It was very brown and meant to be drunk at a bit of a warmer temp. There was a decent mocha head and appealing coffee aroma. When sipping, it coats your tongue but is not a thick beer, and along with the great coffee smell there is a well rounded, entirely coffee finish. IBA (6.8/38) – This seemed to be the summer of black IPAs (which Gillian did not mind) and the scent of the beer was hoppier than the 38 IBUs would predict. It had a similar tan head to the Fuel Cafe, but the color was an interesting Dr. Peppery brown-red color. The taste was a good mix of hops and blended malts, and with just a little bite, it then settled back down to a smooth finish.